Anyway, a little background: I was never much of an NFL fan before I moved to Pittsburgh, and I can't say that I've become a convert, but now that I'm making Pittsburgh my home, I've certainly been doing my part to embrace our hometown Steelers. For my first Hallowe'en in Pittsburgh, I donned a #43 jersey, gold football pants, and a wig, and when the Steelers made it to Super Bowl XLV last year, I joined everyone else in town in waving my terrible towel and cheering on my team. When I found out several weeks ago that Olio Fresca Pasta would stop selling at the Pittsburgh Public Market, I made a few trips out there to stock up on my flavored pasta supply. 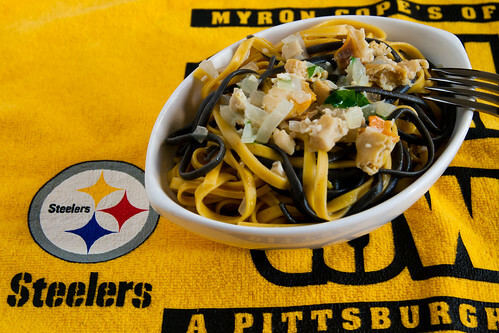 One of the varieties I got was the Pittsburgh's Passion Linguine - black squid ink mixed with yellow saffron linguine. I thought it might be a fun way to support the Steelers during the playoffs, so I made this for the first round game between the Steelers and the Broncos. Unfortunately, the Steelers lost a close one that day, but I'm sure they'll be back next year stronger than ever. Check out other recipes using Olio Fresca products here, and there will be more to come soon! To purchase Olio Fresca pasta, check out their website for currently available products.